Lakes of liquid ethane, methane and nitrogen. Coloured in blue and brown. Photographs Kraken Mare, the large lake at the lower left, is twice as large as can be seen here. The lakes of Titan, a moon of Saturn, are made of liquid methane. The lakes were found by the Cassini-Huygens space probe. The larger lakes are known as maria (seas) and the smaller ones as lacūs (lakes). It was possible that there were seas of liquid methane on Titan and first suggested after reading Voyager 1 and Voyager 2 information that showed Titan to have a thick atmosphere, capable of supporting lakes, but exact evidence was not found until 1995 when pictures from the Hubble telescope and other telescopes had already shown some proof of liquid methane possibly in lakes or planet-wide oceans, similar to oceans on Earth. The Cassini mission proved there are liquid lakes on Titan, but not at first. When the probe arrived in the Saturnian system in 2004, scientists hoped that hydrocarbon lakes or oceans might be seen in reflected sunlight from the surface, but no reflections were found. Scientists still believed that liquid ethane and methane would be found near Titan's poles, where they expected to find lots of liquid. At Titan's south pole, a large dark area named Ontario Lacus was the first lake identified, possibly created by rain as clouds are often seen in the area. A possible shoreline was also identified at the pole in radar images. As the Huygens-Cassini probe flew by on July 22, 2006, its radar took pictures of the northern part of the planet (which was in its winter), a number of large, smooth areas were found on the surface near the northern pole. Based on this data, scientists announced "definitive evidence of lakes filled with methane on Saturn's moon Titan" in January 2007. The Cassini–Huygens team decided that the smooth areas are the hydrocarbon lakes they had been searching for, the first lakes found off Earth. Some valleys appear to have rivers. The satellite was not able to show pictures of lakes moving in the wind. The heavy moisture and clouds of methane near Titan’s surface could be a sign of evaporation from lakes. The lakes cover 0.002–0.02% of Titan's surface. Size of Ligeia Mare and Lake Superior. The Cassini-Huygens probe flew by in February, 2007, taking radar and camera pictures of some large areas near the north pole that may be large areas of liquid methane and/or ethane, including one sea larger than 100,000 km² (larger than Lake Superior), and another area similar in size to the Caspian Sea. Pictures taken near Titan's southern pole in October 2007 showed similar, but far smaller, areas that look like lakes. Picture of Titan taken during Huygens' landing, showing hills, rivers and beaches. The Cassini-Huygens probe, flew very close to Titan in December 2007, and took infrared pictures of the chemicals on the surface and found a lake called Ontario Lacus near the south pole. Scientists studying the infrared pictures decided that one or more of the large lakes in the pictures of Saturn's moon Titan does hold liquid and that the liquid is made of hydrocarbons. They have also found ethane on Titan. This mission proves Titan to be the only other planet known to have liquid on its surface. The lakes make Titan a very important planet for studying weather science. Liquids, gases and temperatures are at play on Titan. This should help the science of weather forecasting. Lakes were not found near near Titan's center of Titan which was studied on January 14, 2005. A part of the Huygens-Cassini probe landed there. The pictures taken by the probe as it fell showed no open areas of liquid, but showed rivers that had dried. It was at first thought that dark areas near the center of Titan could be a lake of a liquid or tar-like substance, but the probe landed on the dark area, and it is solid without any liquid. A device known as a penetrometer studied the surface as the probe landed and seemed to find wet clay. Scientists believe that the penetrometer may have landed on a large pebble, and they say that the surface is similar to sand made of ice. Pictures taken after the probe landed show a large flat area covered in pebbles. The pebbles may be made of water ice and are partly rounded, which indicates fluids. On February 13, 2008, scientists said that Titans polar lakes contain "hundreds of times more natural gas and other hydrocarbons than all the known natural gas on Earth." The desert near the center of the planet are not liquid but do have more organics than Earth. In June 2008, Cassini's Visible and Infrared Mapping Spectrometer confirmed the presence of liquid ethane beyond doubt in a lake in Titan's southern hemisphere. Predictions of Titan's clouds are that during in a Saturnian year, liquid moves from the equator to the poles, in clouds, and falls as rain. Titanian maria (large hydrocarbon seas) are named after sea monsters of Earth. Kraken Mare 68.0N 310.0W 1,170.0 The Kraken, Norse sea monster. Areas named Lacus are believed to be methane lakes. They are named after lakes on Earth. Ontario Lacus 72.0S 183.0W 235.0 Lake Ontario, on the border between Canada and the United States. ↑ "Overview - Cassini". Solar System Exploration: NASA Science. ↑ 2.0 2.1 2.2 Titan at the USGS Gazetteer of Planetary Nomenclature, accessed April 12, 2008. ↑ 5.0 5.1 5.2 Stofan, E. R.; Elachi, C.; et al. (January 4, 2007). "The lakes of Titan". Nature 445 (1): 61–64. doi:10.1038/nature05438. http://www.nature.com/nature/journal/v445/n7123/abs/nature05438.html. Retrieved 2007-08-27. ↑ Emily Lakdawalla (June 28, 2005). "Dark Spot Near the South Pole: A Candidate Lake on Titan?". The Planetary Society. Retrieved 2006-10-14. ↑ Jet Propulsion Laboratory (September 16, 2005). 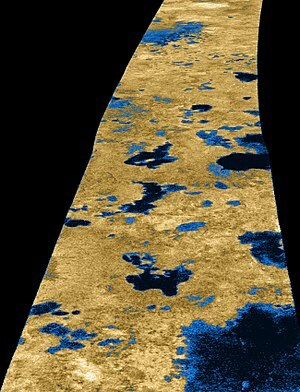 "NASA Cassini Radar Images Show Dramatic Shoreline on Titan". Press release. http://www.spaceref.com/news/viewpr.html?pid=17829. Retrieved 2006-10-14. ↑ "PIA08630: Lakes on Titan". NASA Planetary Photojournal. NASA/JPL. Retrieved 2006-10-14. ↑ "Titan Has Liquid Lakes, Scientists Report in Nature". NASA/JPL. January 3, 2007. Retrieved 2007-01-08. ↑ Giuseppe Mitri; et al. (February 2007). "Hydrocarbon Lakes on Titan" (PDF). Icarus 186: 385–394. doi:10.1016/j.icarus.2006.09.004. http://www.lpl.arizona.edu/~showman/publications/mitri-etal-2007-lakes.pdf. ↑ "Cassini Spacecraft Images Seas on Saturn's Moon Titan". NASA. 2007-03-13. Retrieved 2007-03-14. ↑ Emily Lakdawalla (2007). "News flash: Lakes at Titan's south pole, too, on top of the land of lakes in the north". The Planetary Society. Retrieved 2007-10-12. ↑ "NASA Confirms Liquid Lake on Saturn Moon". NASA/JPL. ↑ "Titan probe's pebble 'bash-down'". BBC News. April 10, 2005. Retrieved 2007-08-06. ↑ Emily Lakdawalla (January 15, 2005). "New Images from the Huygens Probe: Shorelines and Channels, But an Apparently Dry Surface". The Planetary Society. Retrieved 2005-03-28. ↑ "Titan Has More Oil Than Earth". February 13, 2008. Retrieved 2008-02-13. ↑ Adam Hadhazy (2008). "Scientists Confirm Liquid Lake, Beach on Saturn's Moon Titan". Scientific American. Retrieved 2008-07-30. ↑ "Tropical Titan". astrobio.net. 2007. Retrieved 2007-10-16.